This weekend was supposed to be the end of season party for Hovden skisenter, with a ski race, freestyle jumps in the park area, concerts and after-ski, plus great skiing conditions, blue skies and no wind on Saturday. On Thursday we had blizzards of snow that threatened to completely close the roads, but by Friday afternoon the skies were blue, there was no wind, and masses of fresh snow was being pisted into great skiing conditions. The lucky people skiing on Saturday had a wonderful time - bright sunshine, still no wind, fantastic skiing, no queues at any of the lifts, and plenty of attractions. There was a ski race open to all, freestyle ski-jumping in the park area, plus a concert and after-ski party in the main cafeteria. 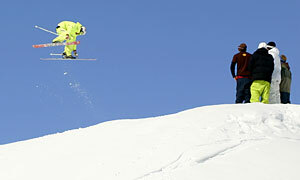 With such good ski conditions, it has been decided to open again next weekend - 28 and 29 April. The main (4 seat express) chairlift will be open, but not the other lifts. The ski-hire shop will also not be open, but there will be a cafe open at the top of the chairlift, with views down over Hovden.